Introducing to Croxdale Subaru, this beautiful XV 2.0 i SE Premium Lineartronic AWD finished in a stunning Cool Grey Khaki with contrasting full black leather interior and heated seat function in the front. The XV is a reliable and superb compact crossover which is effortlessly stylish, it boasts always-on Symmetrical All-Wheel Drive, a Boxer engine and incredible all-round performance. This particular model comes brimming with amazing specification including; satellite navigation which is displayed on a 8in colour touchscreen monitor, dual zone climate control, rear vision camera, DAB radio selection, hill start assist, voice recognition system, push button start, automatic rain sensor wipers, and electric windows. This is a fantastic, well-made and durable 4X4 vehicle, which comes equipped for any journey. Buy with confidence knowing you will receive Subaru warranty until 2023, 12 month roadside assistance and 30 days exchange programme. 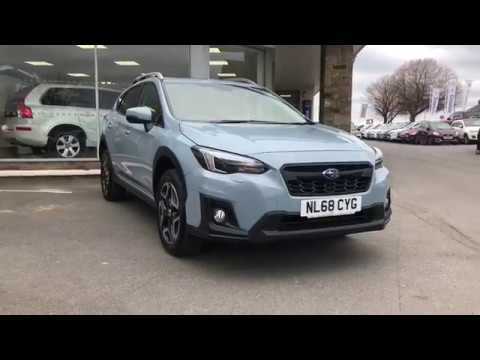 This car is available to view and test drive at Croxdale Subaru Durham, our Subaru experts will ensure you receive a fantastic experience. We also have a range of finance options available from no deposit across our used car range. Buy from Croxdale Subaru and you will have full peace of mind of a pre-sales inspection by Subaru trained technicians. We are based on the A167, Durham - 5 miles from Durham City Centre. Let our family look after yours - Call our team on 01388 814671 - we look forward to helping you purchase your new Subaru.